1 of the normal males will be remaining here as a pet, as he is missing a foot due to over-grooming by his mum and 1 of the dom spot girls will be staying. Another of the dom spot girls is off to another breeder and all other pups have pet homes lined up. This was an exciting litter as mum's only colouration is a dorsal stripe and spots on her ears, as is her fathers colouration, so this pairing was to see if pups would present as dominant spot or this potential striped pattern. 4 Pups had the same striped pattern as mum and 2 pups were normal/agouti like their dad. 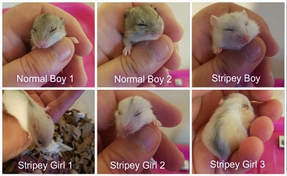 1 striped girl and 1 normal boy are staying here, the other striped pups are going to other breeders and the remaining normal boy has a pet home lined up. 1 Female will be staying here, the rest of the litter have pet homes lined up. Both boys went off to Doric Hamstery and the girls stayed here. Tilia (Black-Eyed White) remained in the hastery and Blossom (Normal/Agouti girl) is owned by my sister. Both pups stayed here. Jack-Jack is a major member of the show team and being used for breeding. Lina, unfortunately, passed away at 8 months old due to health complications. Both Dominant spot girls remained here, Possum being the lesser marked of the two and Holly being the other. The Normal/Agouti girl and the Normal/Agouti boy went off to Oblivion Hamstery. Called Sakura's Secrets because Sakura gave no indication she was pregnant, no weight gain, no change in size or behaviour and no real behaviour change after having them either. I found them in the nest after checking on Sakura, who hadn't come out to say hello. Both pups (Heath and Lily) remained here and are part of the show team as well as currently being used for breeding.